We know that a lot of work goes in before your listing is even ready to hit the market but after your listing becomes active is when we need to put on our marketers hat. I'm going to walk you through an easy and effective checklist for the getting the most out of your new listings. Each and every listing that you take is an opportunity to gain more new business (or lose business). There is no better form of marketing than a consumer seeing another person put their trust into your business. 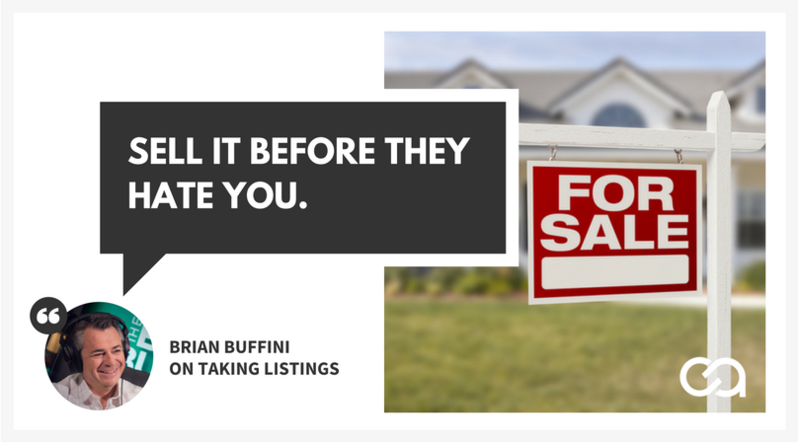 Listings are the equivalent of billboards for your business. The difference is that you're not paying thousands of dollars per month for the exposure. Listings equal more buyers from sign calls and more sellers after and if they see you successfully sell their neighbor's property. Don't waste the opportunity to maximize your lead generation while your billboard is up! Let's jump right into the top 10 things you need to do after listing a property for sale. Grab your phone and a selfie stick if you have one and record yourself announcing the new listing and the details of the property and then give a short tour of the home and tell them how to reach you for more information and to schedule a showing. The video above is an example of going above and beyond and hiring a crew to go out and help you shoot your video. After reaching out to the agent above, he went on to say he absolutely recommends you to hire someone to shoot your video because you can use it in your listing presentations and then after the house sells, as a “Just Sold Announcement” post. The production value is what gives this video the professional look you can't quite put your finger on. Production value refers to the lighting, the effects, the sound and overall cinematic feel of the video. After some research, the average cost to have a crew shoot, edit and produce a Just Listed video is around $350. Don't worry if you don't have the resources to do something that fancy, just bust out your smartphone and shoot that video. Pro-Tip: When using your phone, shoot the video in landscape mode! For more tips and tricks on shooting video read our Complete Beginners Guide to Video Marketing for Real Estate. Now that you have your video, post the video on your Facebook business page and then share it on your personal profile. Also, upload the video to YouTube and title the video the street address listed by [insert your name], this will help you show up first when someone Googles the address. Example: 1234 CompleteAgent Ln. 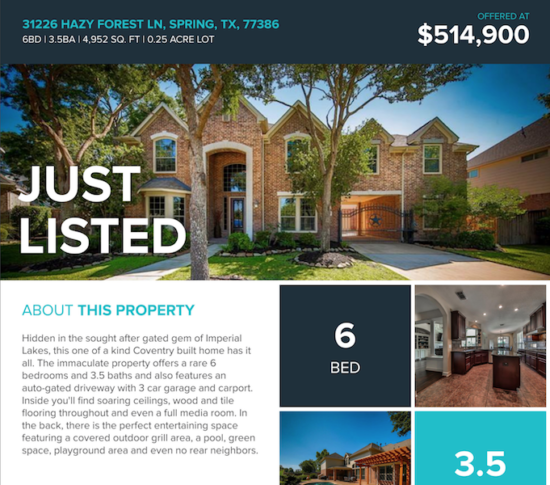 Houston, TX 77005 Listed by Adam Yera and CompleteAgent Realty. The image above shows just about every popular social media channel where you can share your video but I would recommend to committing to the Big 3 which are Facebook, YouTube & Twitter. If the likely buyer of your listing or even just your target demographic is younger, you should do a walk through and announcement post on Instagram stories and Snapchat. These videos will have to be recorded separately because each platform has different maximum lengths but it's super easy and will only take you a few minutes. You're also going to want to boost the video on your Facebook page and select Video Views as your goal. This allows us to show ads only to people who watched the video for more than 3 seconds or 10 seconds, aka engaged viewers. 3. Reread & Revise the Listing Description. Wait! Before you skip over this thinking to yourself “Pshh my listing description is fine.”, please just hear me out. You might think this one is a cop-out on my part but I promise you it's not and it's really important. It's just plain ol' lazy. I've actually gained a client who sold and bought with me because of a listing description that I wrote. She literally called me up and said that she loved the way I wrote about the property and that she wanted me to represent the sale of her home. How many agents can honestly tell you that they got business from a listing description? After hearing from others, go over the description a couple of more times yourself making sure to use the checklist in our post on the 8 Steps to Writing Irresistible Listing Descriptions. I know the curiosity is killing you, so here's the exact listing description that made me $19,500. Can you see the differences? Warning: Doing this right will make sellers very happy with you and they'll probably share the post with all of their friends. If you have a website, writing a blog post about the listing is a great way to capture some of that early SEO Google juice. If you don't have a website, still write the post but do it on Facebook as a ‘note'. Facebook notes is essentially a blog post hosted on Facebook and one benefit is that it loads super fast and you can link to your office's website in the post. Be sure to include the photos your professional photographer shot 😉 and tell a story about the house. 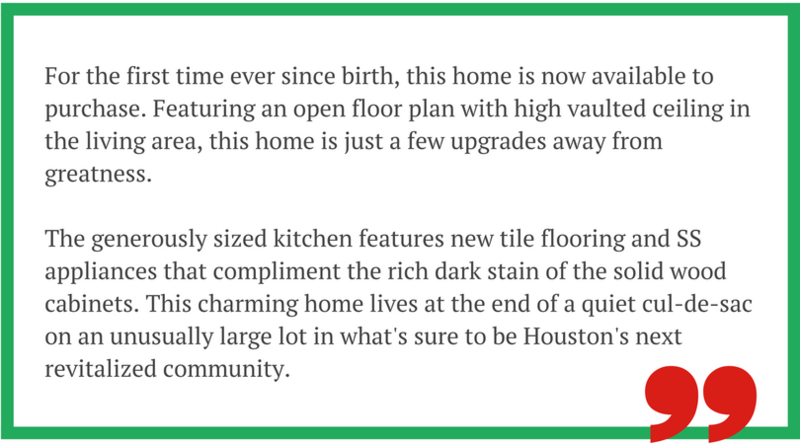 Write a story about the home or property that highlights all of the features and benefits. The goal is to help buyers and readers visualize themselves in the home. 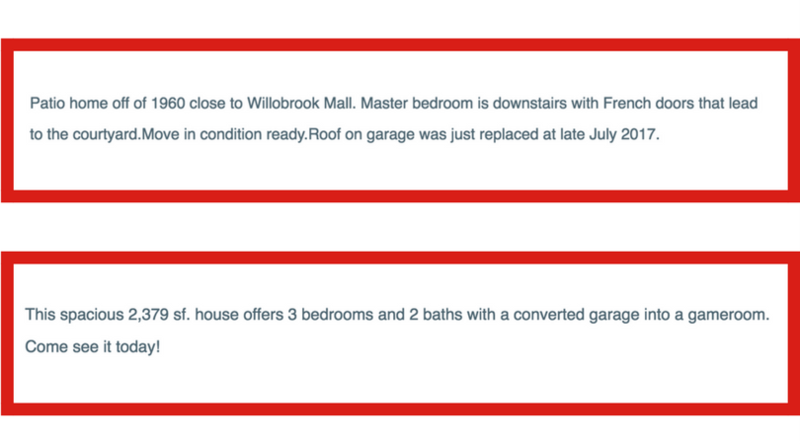 Your irresistible listing description from above will definitely come in handy for this part but don't copy it word for word because then you'll be competing with the big portal pages for SEO who only have the listing description. The Title – Ex: Stunning Downtown Condo For Sale – 1111 Grove St. Houston, TX. The Home – Write about the features and specifics of the home that didn't fit in the listing description. The Area – Talk about the community, neighborhood, and amenities if any. Remember location, location, location. City Level – Write a couple of paragraphs from a city area standpoint for people who might be relocating. So take your time, put some love into it and publish that post. Most agents only hold open houses to please their sellers but they pretty much write them off as a 2-hour time slot for them to catch up on some admin work but that's a shame because open houses can have a massive impact on your business. I teach my agents that I work and coach with that the goal of an open house is not to sell that specific house, the goal is to sell any house, or in other words, to meet a buyer who is ready, willing, and able to buy a home in the next 30-90 days. The goal is to to meet a buyer who is ready, willing, and able to buy a home in the next 30-90 days. Now how would you treat your open houses visitors knowing that the new goal? A little differently I hope. One often overlooked benefit from open houses is the interaction and engagement you'll have with the neighbors, especially the nosey neighbors who visit every open house in the neighborhood and notices when agents don't hold them open. If you are lucky enough to be visited by a nosey neighbor, make sure to give them some extra attention and really try to make an impression. Oh and also follow up and thank them for stopping by with a nice handwritten note. Click here if you want to learn how to hold open houses that actually work and get the exact blueprint on my proven open house strategy. If you aren't taking the time or initiative to meet the neighbors of your clients, you're doing it wrong. In all seriousness, you're not taking advantage of literally the best excuse (and one of the only excuses in my book) to knock on a homeowners door. When you're planning your open houses invite the neighbors over for a special ‘Neighbors Only Previewing Party' and offers snacks and refreshments. Schedule the previewing for 30 minutes before the scheduled start date of your open house. This way, when it's time for your open house there will already be some traffic inside and people attract more people. That's whats called the “herd mentality” and we're going to leverage it in our marketing. Not to mention the one-on-one face time you'll get with all of the homeowners who stop by. The company I recommend for ready-to-go and simple-to-setup ‘Just Listed' postcards is Corefact. If you want to create or upload your own designs then I suggest you take a look at Quantum Postcards, which offers a little bit more flexibility in a sleeker interface. Professional Photographs – Impress the neighbors with your beautiful professional photography. Contact Information – Include a working website address, email address and phone number for those who want to call you. The goal of the just listed cards is to show that you invest in selling your client's homes, to build your brand and to generate interested seller leads. You can boost your odds of getting seller leads by including a URL to a home value landing page that you have. Pro-Tip: Direct mail can get expensive quick. Save money by only sending postcards to homeowners who have owned their home for at least 3 years. You'll need some marketing materials like flyers and digital images to help get the word out and it doesn't get much better than FREE. ListReports is an awesome online tool that is completely FREE for Realtors. 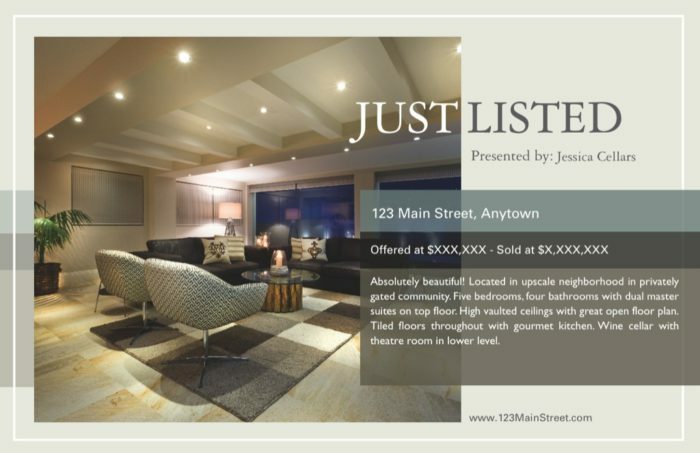 Just enter the address of your listing and within an hour you have a complete marketing package that delivers exactly the information your potential buyers want to know. Their platform is really amazing they give you all the marketing materials you need to market like a pro including just listed flyers, open house flyers, promotional flyers with price and without price, property reports, neighborhood reports, infographics and even just sold flyers. You definitely want to check out ListReports if you haven't before. They make money by allowing you to connect a lender to their platform that pays for their premium service and offers awesome co-branding materials. Their premium option includes single property websites and sign riders and more. I'm not a fan of spamming my leads or local agents with a property email blast, in fact, that's the quickest way for me to click that spam checkbox next to your email and never see your emails again. However, you should most definitely be letting relevant people who may be interested in that property. For example, is the property a potential rental property or a fixer-upper? If so, be sure to let those people know with a short and personalized email or text. Check your CRM (Contact Relationship Manager) for leads who showed interest in listings similar to yours and reach out and let them know about your new listing. Worst case scenario they're not interested in that house but you at least got the conversation going and can start searching more in depth for them. There's an old saying that I once heard Brian Buffini say and I'll never forget it. He says, “Everyday that goes by with your sign in their yard, they hate you just a little bit more. Sell it before they hate you.” and it's so true. Talking with your seller once a week can do wonders for your relationship with that client. I know that a lot of times there really isn't much to report on if for instance you're in a slow market but the key is to just talk with them anyway. Having your home for sale is stressful because you're putting yourself out there and letting people walk through your home every day. Put your clients at ease by just touching base once a week and telling them everything that's going on with their listing. When marketing your listings, there are very few wrong answers on how to get the word out. Take advantage of the exposure that having a listing on the market gives you and make sure it's the right exposure. It doesn't look good to have listings that have been sitting on the market for 6 months. What are you doing to market your listings? Anything special or that you've done that works that I missed? Please share with us and let us know! Check out the SlideShare below for an overview of this post!